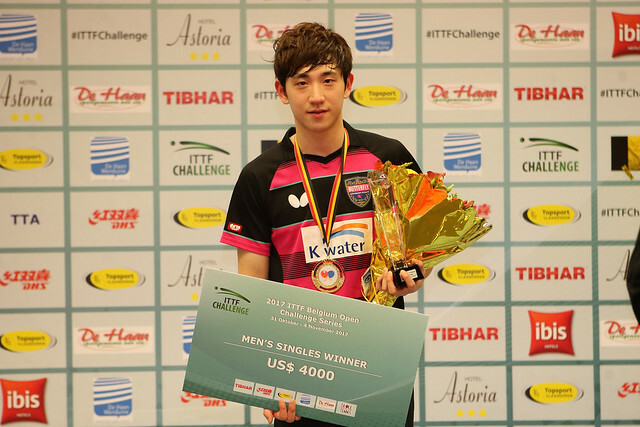 Success came the way of the principal names as play commenced in the Women’s Singles event at the 2017 ITTF Challenge Belgium Open in De Haan on Thursday 2nd November. Japan’s Hitomi Sato, the top seed, duly progressed unhindered as did colleague Saki Shibata, the no.4 seed, alongside Chinese Taipei’s Cheng Hsien-Tu and Korea’s Lee Zion; all accounted for adversaries who had been required to compete in the qualification tournament. Hitomi Sato beat Iran’s Neda Shahsavari (11-3, 11-4, 11-1, 11-5), Saki Shibata overcame Finland’s Anna Kirichenko (11-5, 11-3, 11-2, 11-6). Likewise Chen Hsien-Tu accounted for Chile’s Daniela Ortega (11-7, 11-8, 11-1, 11-3), whilst in a rather more exacting contest Lee Zion halted the progress of India’s Pooja Sahasrabudhe (9-11, 9-11, 11-6, 11-2, 11-8, 12-10). However, there were surprises, the players to cause the upsets being Austria’s Karoline Mischek, Korea’s Kim Eunji and Russia’s Maria Malanina in addition to Laura Pfeffer of France, Croatia’s Sun Jaiyi and Charlotte Carey from Wales. Notable performances with pride of place going to Kim Euni; no world ranking, previous international experience minimal, she beat Russia’s Valentina Sibatova, the no.16 seed (11-7, 11-8, 2-11, 11-9, 5-11, 11-9). A six games win for Kim Eunji, it was the same for Karoline Mischek who beat Turkey’s Sibel Altinkaya, the no.20 seed (11-9, 11-4, 11-4, 9-11, 9-11, 11-9), as it was for Maria Malanina in opposition to Belgium’s Margo Degraef, the no.31 seed (11-5, 10-12, 11-1, 6-11, 12-10, 11-4). Meanwhile for Charlotte Carey and Laura Pfeffer life was somewhat more testing, both needed the full seven games in order to book second round places. Charlotte Carey beat Pauline Chasselin, the no.26 seed and like Laura Pfeffer from France (11-9, 13-11, 9-11, 8-11, 7-11, 11-6, 11-9); in an equally close contest Laura Pfeffer defeated Russia’s Olga Kulikova, the no.32 seed (11-6, 4-11, 5-11, 14-12, 7-11, 11-6, 12-10). Close calls, somewhat conversely for Sun Jiayi, after three close games, she asserted her authority on proceedings when facing Hungary’s Mercedes Nagyvaradi, the no.21 seed (11-8, 16-14, 8-11, 11-1, 11-1).